Robert Smith is currently the Assistant Director of Music at St. Wilfrid's Church, the York Oratory in Formation. In 2014/15 he was the Assistant Organist at St. Paul's Bloor Street, the largest Anglican church in Toronto (Canada), where he regularly accompanied the choir. Previously the Organ Scholar of Somerville College, Oxford, he accompanied and occasionally directed the choir of that college for their regular services and concerts. Robert began his musical life aged 5 when he began learning the piano, achieving Grade 8 Distinction aged 13. Having longed to play the organ from an early age when he was awed by the brilliance of Widor’s Toccata, he then decided to take up the organ under the tutelage of Henry Fairs at the Birmingham Conservatoire, where he remained for five profitable years. During this time he regularly played for his parish church in Bournville and took part in masterclasses at Lincoln's Inn and St. Chad's Cathedral, Birmingham. Upon reaching Oxford, Robert received lessons from Stephen Farr as well as achieving his ARCO diploma, for which he also received a prize. He has had the pleasure of participating in numerous choir concerts and tours, notably at Blackburn Cathedral, Lancaster Priory, Ampleforth Abbey, Coventry Cathedral and three times at St. Paul’s Cathedral in London. During his time at Oxford Robert performed in several recitals, including at Harris Manchester College, Oxford Town Hall and at Exeter College as well as participating in masterclasses led by David Goode, Guy Bovet, Thomas Trotter and William Whitehead. 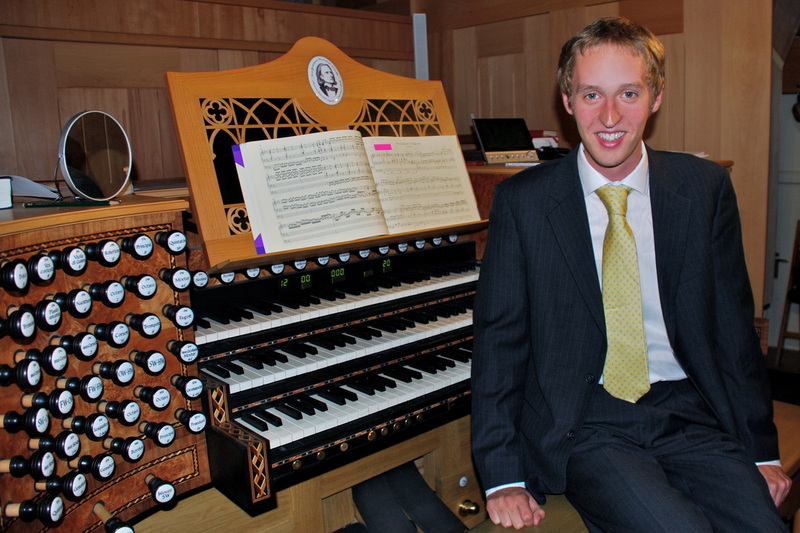 He has also been a finalist in the Northern Ireland International Organ Competition on three occasions. Recently, Robert collaborated with conductor Nicholas Cleobury for a concert recorded by the BBC. In summer 2014, Robert toured the east coast of America with the Choir of Somerville College, where he played for a service at Washington National Cathedral, as well as performing a solo recital at the Cathedral of the Holy Cross, Boston. Following this, he undertook four extensive solo recital tours of Germany, playing baroque Wagner and Silbermann organs as well as romantic instruments in Berlin, Brandenburg, Saxony, Saxony-Anhalt, Thuringia and Bavaria. His first commercial solo CD for the German label JUBAL was released in April 2015. Robert also pursued piano studies with Margaret Newman, achieving a DipABRSM aged 16, winning numerous prizes in music competitions, both for his solo playing and as part of a piano trio.